$225 for four sessions – ask about VIP pricing. Traditional Chinese medicine brings to mind acupuncture and the use of natural herbs as healing remedies. 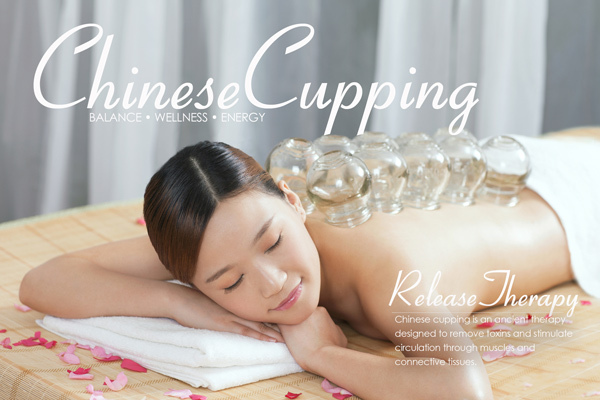 Cupping is a lesser-known treatment that is also part of Oriental medicine, one that can provide an especially pleasant experience. One of the earliest documentations of cupping can be found in the work titled A Handbook of Prescriptions for Emergencies, which was written by a Taoist herbalist by the name of Ge Hong and which dates all the way back to 3000 AD. Cupping is the term applied to a technique that uses small glass cups as suction devices that are placed on the skin and a vacuum created. Once the suction has occurred, the cups can be gently moved across the skin (often referred to as “gliding cupping). The suction in the cups causes the skin and superficial muscle layer to be lightly drawn into the cup. Cupping is much like the inverse of massage – rather than applying pressure to muscles, it uses gentle pressure to pull them upward. For most patients, this is a particularly relaxing and relieving sensation. Once suctioned, the cups are generally left in place for about ten minutes while the patient relaxes. The suction and negative pressure provided by cupping can loosen muscles, encourage blood flow, and sedate the nervous system (which makes it an excellent treatment for high blood pressure). Cupping is used to relieve back and neck pains, stiff muscles, anxiety, fatigue, migraines, rheumatism, and even cellulite. For weight loss and cellulite treatments, oil is first applied to the skin, and then the cups are moved up and down the surrounding area. Like acupuncture, cupping follows the lines of the meridians. There are five meridian lines on the back, and these are where the cups are usually placed. Using these points, cupping can help to align and relax qi, as well as target more specific maladies. By targeting the meridian channels, cupping strives to ‘open’ these channels – the paths through which life energy flows freely throughout the body, through all tissues and organs, thus providing a smoother and more free-flowing qi (life force). Cupping is one of the best deep-tissue therapies available. It can affect tissues up to four inches deep from the external skin. Toxins can be released, blockages can be cleared, and veins and arteries can be refreshed within these four inches of affected materials. Even hands, wrists, legs, and ankles can be ‘cupped,’ thus applying the healing to specific organs that correlate with these points. This treatment is also valuable for the lungs, and can clear congestion from a common cold or help to control a person’s asthma. In fact, respiratory conditions are one of the most common maladies that cupping is used to relieve. You can order directly by clicking here and begin using your favorite oils within a couple of days. Note: Cupping can cause purple marks to appear on the skin as the blood reaches the lower dermis. This is perfectly natural and the marks will disappear naturally over the course of a few days.